[Side Bar] When I was in high school, I had a weekend job at Perimeter Mall. Occasionally, I’d have to get off 285 on the way home, due to traffic, and most of the time I’d end up lost. A good portion of the time that I lost, I ended up at Merchants’ Walk. How? I may never know. It took me almost ten years to learn how to get back to West Cobb from there! 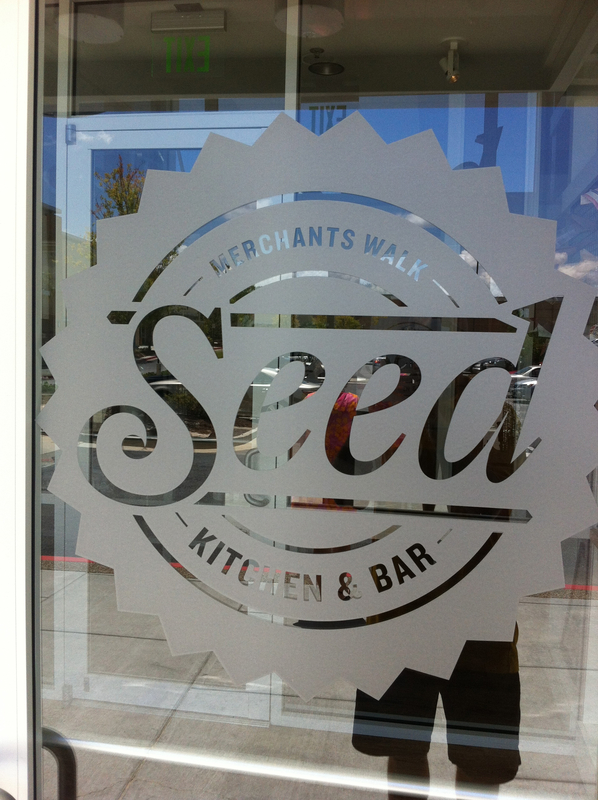 Seed is located in a strip mall near Merchants’ Walk on Johnson’s Ferry, deep in a corner. We drove by it the first time without seeing it, made a U-turn and saw the small sign as we drove back. 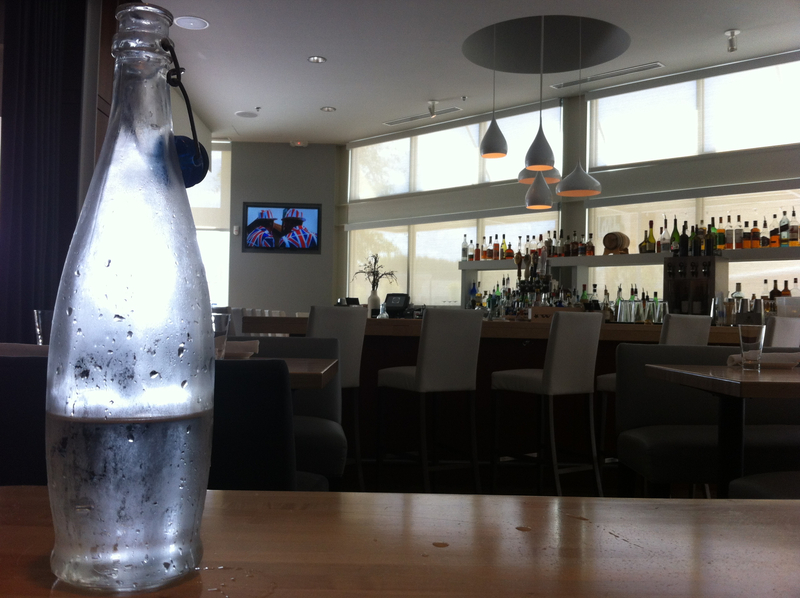 The biggest complaint about this restaurant was the tables. We were seated at some kind of high-top banquette, with a table that was on two pedestals and which moved every time we moved our feet. A couple actually abandoned the table next to us after being seated, and the couple that took their place complained about the table as much as we did. The view above is from our table-top, looking toward the bar. The place is all white and light, very open. 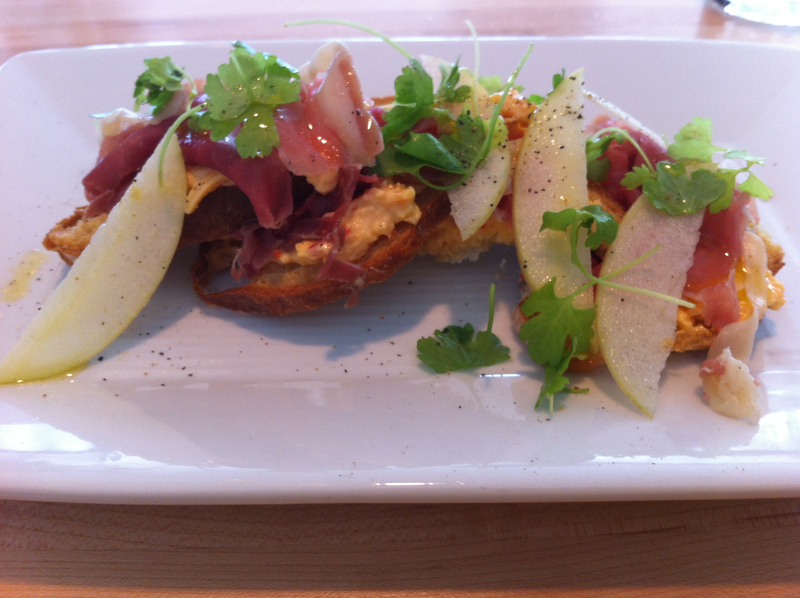 I started with their pimento (their spelling) cheese crostinis, topped with ham, celery and apples. I’ve never had pimento cheese with apples, but it is a really nice flavor combination. Jo started with a roasted (probably not, at least they didn’t taste that way to her) beet and grapefruit salad, with parmesan cheese and pistachios on a bed of arugula. 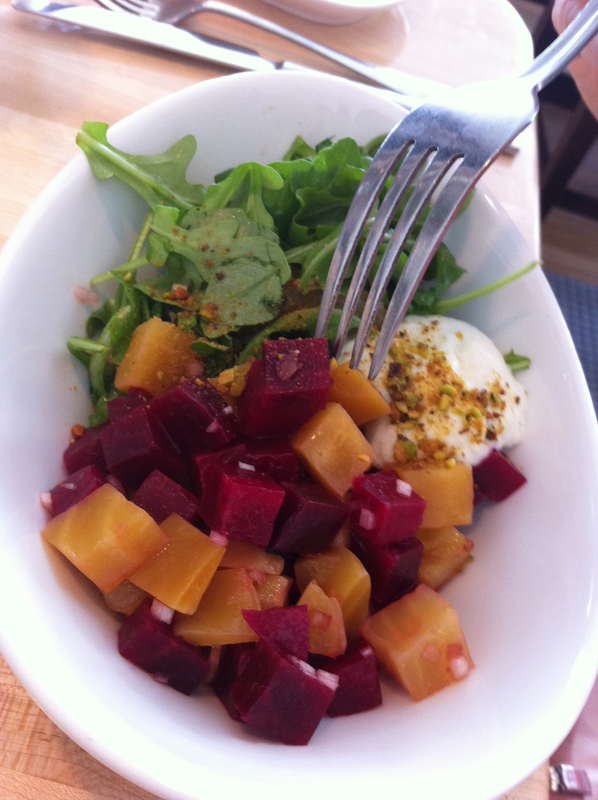 Aside from the lack of roasting of the beets, she said that it was a good salad. I followed my pimento cheese up with the Merchant Burger, served with Udderly Cool cheddar (I held the caramelized onions). The roasted tomatoes were an unexpected grace – they made ketchup unnecessary. 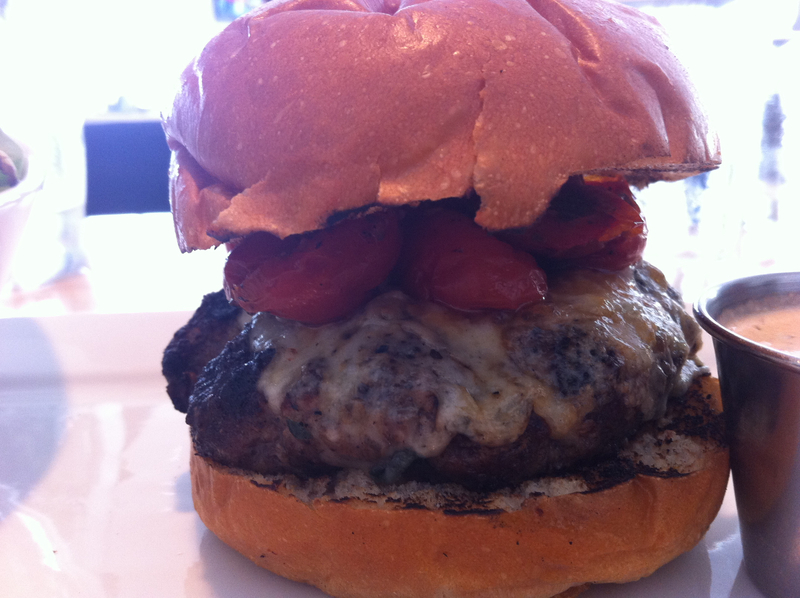 The burger itself was quite good – crunchy sear on the crust of the burger, cooked true medium inside. More cheese on this burger would have improved the overall taste at least three-fold. Jo had the fish sandwich. 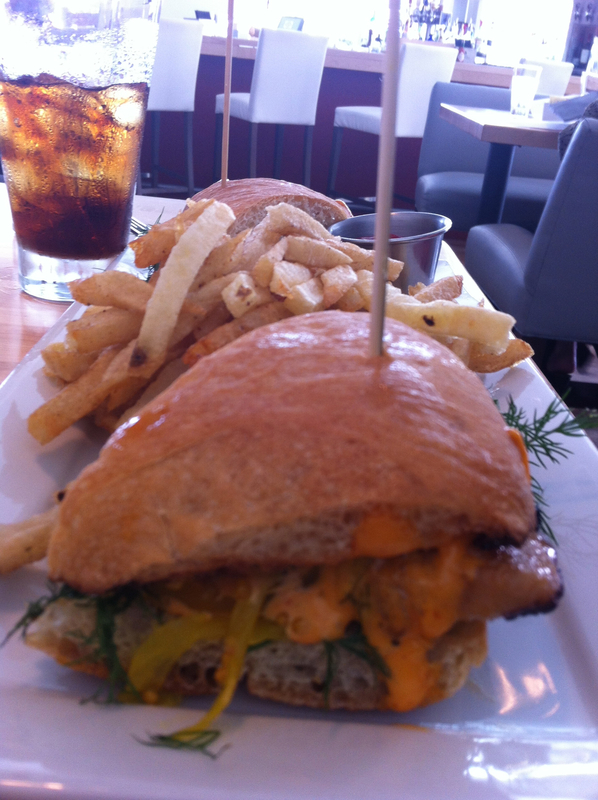 It was grilled tilapia, on ciabatta bread with ginger / onion marmalade with Sriracha sauce, cilantro and dill. I didn’t try the fish, but I took a bite of the bread and it had just the right amount of “bite” – not pepper-y or tabasco-y, but it got your attention. 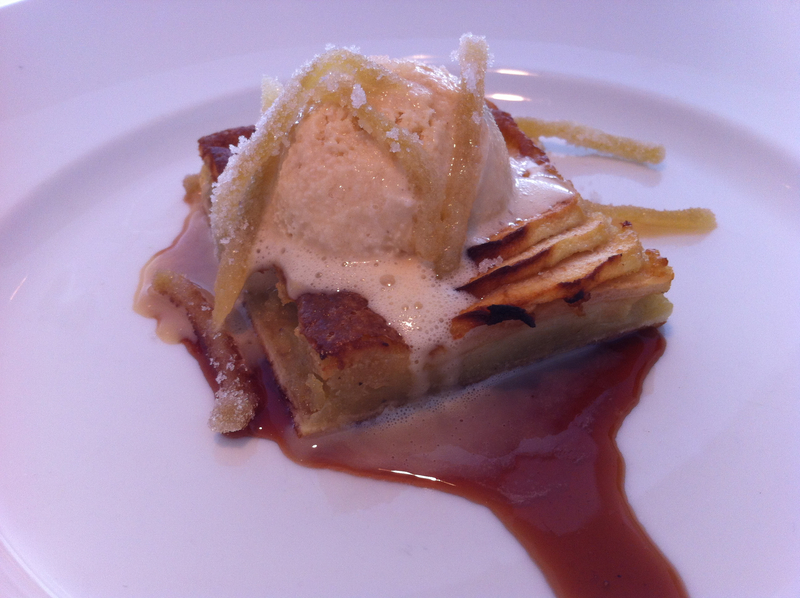 Then we followed it all with a brown butter apple tart with Thai tea ice cream and candied ginger. I thought the waiter was having a hard time saying “Chai tea” when he said “Thai tea”, to the point that I went back and looked at the menu. The tart was almost all apples with little bread. The candied ginger tied all of the tastes together nicely. But, if we go back, next time I’ll have the Key Lime.